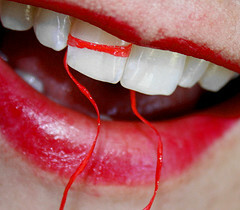 Flossing teeth is by far the most important habit when it comes to preserving the health of your smile. Dentists in SW Portland, OR Dr. Howard Jarvis and Dr. Tiffany Goldwyn encourage patients of all ages to floss once each day, either in the morning or at night. Flossing Is More Important Than Brushing? While brushing teeth is hands down essential for good dental health, flossing teeth is more important because it removes plaque from the nooks and crannies of your teeth where a toothbrush can’t reach. When plaque is allowed to gather in those spaces between teeth, tooth decay is more likely and common than cavities on other surfaces of your teeth. The bacteria in plaque eats away at the precious enamel of teeth, leading to the development of cavities. If you’re not flossing teeth – and the American Dental Association has found that almost half of adults aren’t flossing teeth regularly – then you’re missing about half of the plaque in your mouth. Even when done carefully and correctly, flossing teeth takes under a minute and only needs to be completed once a day. Think about all of the time we take to do other things in life, like brush our hair, eat lunch, or watch a favorite program on TV. When put in this perspective, flossing our teeth takes a very short time but yields a lifetime of benefits when it comes to our smile and overall health. To make flossing teeth more convenient, carry floss picks and use them while driving, waiting for an appointment, or watching television. While not ideal, this flossing tool gets in between teeth and removes harmful plaque. While using dental floss is good after eating corn on the cob or ribs at dinnertime, the function of floss is more than getting trapped food from between your teeth. Dental floss is primarily for removing plaque, which is more difficult to see as it hides in our dark mouths in between our teeth. Take time for flossing teeth, whether food is trapped in between them or not. The presence of pain, swelling or slight bleeding while flossing teeth is a clear sign that you actually need to floss more, not less. These symptoms can be an indication of gingivitis, which is a sign of development of gum disease. To stop the progression of this disease, the answer is to floss more and regularly. This excuse to avoid flossing simply means we don’t want to do it. Flossing teeth takes a minimal amount of coordination and time, and can be done painlessly if it’s a regular habit. However, some of our patients don’ t feel confident about flossing teeth, and we would love to hear that! The dentists and team at Southwest Portland Dental are here to help you become more comfortable and confident taking care of your smile. Call Southwest Portland Dental at 503-244-8112 to schedule your personal appointment!